The extraordinary high tide in the Neponset Estuary a few weeks ago provided a clear message: it’s time for the Commonwealth and our communities to get serious about climate adaptation. In Quincy, our storm photos documented several parking lots full of cars, an office complex, a residential tower and a hotel along the Neponset—all getting thoroughly soaked. In Dorchester, long stretches of the Neponset Greenway bike path, Neponset II Park and Finnegan Park sank beneath the waves. It was a rare event, but coastal flooding is becoming increasingly common along the Neponset. Sophisticated storm surge modeling prepared for portions of the Neponset in 2015 and 2017 by the MA Department of Transportation (MassDOT) shows that flooding will be increasingly frequent in the not at all distant future. By 2030—just 12 years away—flooding similar to what we just experienced is expected to occur once every five years. By 2070—well within the lifespan of development projects being built today—these models call for coastal flooding as bad as what we just saw, or worse, to occur annually. Difficult choices lie ahead for municipalities and the owners of low lying properties along the Neponset. NepRWA will continue to work with communities and advocate for solutions that enhance natural flood protection whenever possible. Below we have reformatted the MassDOT flooding maps to make it much easier to see what’s happening in the Neponset area. But the maps are still a challenge to understand visually. Start by zeroing in on a part of the river you already know, such as Neponset II Park, the I-93/Granite Ave. interchange, or the Neponset River Bridge, and they start to make a bit more sense. 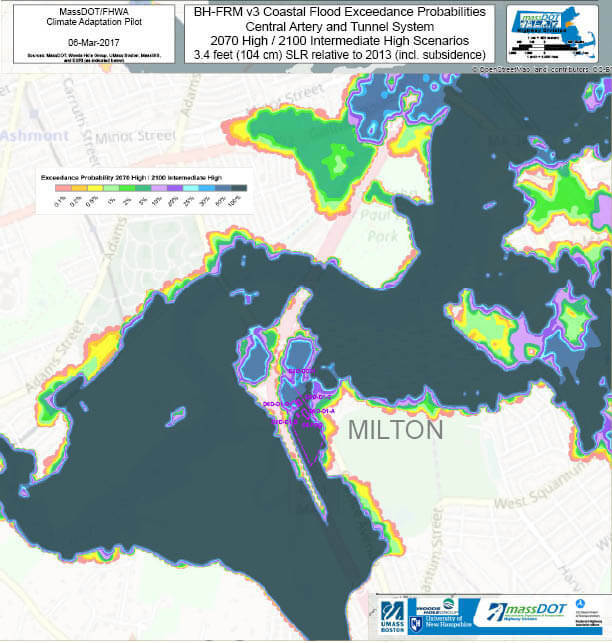 You can view the full MassDot report and all the original maps at the MassDOT web site. The state is scheduled to publish an expanded set of these maps later this year covering the whole state, and hopefully allowing the opportunity to come up with easier-to-visualize versions (putting the streets and existing riverbank on top of the flooded areas would be a good start!). Take a look let us know what you think. Double click on the map to see a higher definition PDF.